As one of our listeners observed after the veil had been lifted on the amps, "That Pulse looks like a set-top box". Maybe it does, too – and Leema mentions in its literature that the Pulse is intended to be for all the family. Maybe, indeed, hi-fi with the easy familiarity of a set-top box is no bad thing in this day and age. It's a bit of a deluxe STB, though, not least thanks to the milled-from solid aluminium front panel and solidly made casework. But it's the navigator-style button array and the blue display that really set the tone. 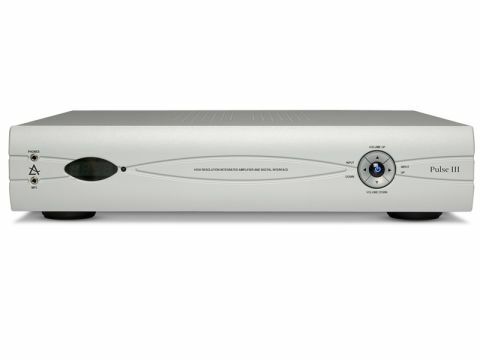 Behind them lurk the clever bits, including an input line-up that features not only phono (MM and MC) as standard, but also four digital inputs: one electrical, two optical and one USB. Further 21st-century convenience is provided by the front-mounted mini-jack input, allowing quick connection of your iThingy. Internal appointments include the inevitable chunky mains transformer and heatsinks, as well as an output stage based on similar temperature sensing transistors to those used by Arcam. On the control side, Leema makes much of its proprietary 'LIPS' interface, which helps integrate various Leema products together and construct a full multi-component system. Our listeners seemed entirely unanimous about the basic character of this amp: it's detailed, lively and quite energetic, but very slightly lacking in bass. Or, at least, it's sometimes lacking in bass. It apparently didn't make this impression in the Led Zeppelin track, where our listeners commented on a rather forceful presentation that suited the music well. Perhaps this masked the bass lightness to some extent, or perhaps it's more to do with the fact that this track, like a surprising amount of rock, doesn't actually do that much with the very lowest frequencies: most of the energy is a little higher up the spectrum. Otis Redding's Sad Song is likewise not particularly bassy, though one listener commented even here that the sound was a little lighter than previous amps had made it. This track benefitted from the good detail and the vocal seemed to be particularly well anchored in the centre – as it ought to be on a mono recording! It was the classical tracks that most clearly showed up where the Pulse III wins and loses. It is great at separating out discrete instrumental lines and at following a melody through thick and thin and it has real vitality that keeps the listener's interest alive. Stereo images are precise and stable and there's no shortage of detail when the going gets heavy. It's just that there is never quite the degree of bass one can get from some other amps and both weight and tonal colour are apt to be missed in direct comparisons. We can report, though, that this is something one easily comes to ignore in longer sessions. Incidentally, the phono stage seems slightly to reverse the main amp's tonality, giving what we felt was better bass overall.